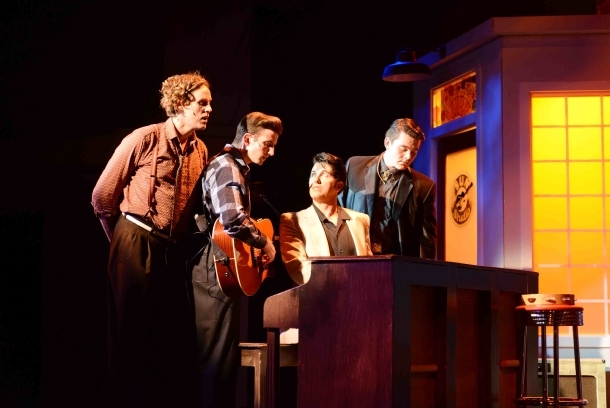 The play focuses on an historical event – one of epic proportions, if you happen to be a fan of Elvis Presley, Johnny Cash, Jerry Lee Lewis or Carl Perkins, or of rock ‘n’ roll in general. Because on this night, in late 1955, Sun Records owner Sam Phillips connived to bring all four of those young stars into his studio, where he recorded one of the most start-studded jam sessions in history. The play builds on that foundation to explore plots lines including the emerging success of the young phenoms, the tensions between them, and Phillips’ reaction to their decisions to move on from his small but mighty recording company. Along the way – at every step – there is music, great music, ranging from rockabilly to rock, from the jazz stylings of Elvis’ girl du jour, to some surprisingly touching gospel quartet offerings. The play – variously billed as 95 and 105 minutes (I wasn’t timing it at the end – I was on my feet, clapping and singing with everyone else) – includes 24 musical numbers, so its clear that while there is plot line and character development, the centerpiece is the music. One of the great things about this play, for me, is that the music is performed live, by the cast members. And while that means the Elvis and Johnny need to be able to play a bit of guitar, the actor playing Carl Perkins has to play a hell of a guitar, and the Jerry Lee character needs to astound on the piano. Tyler Check, as Perkins, is a great guitar master, every note worthy of your attention. Which is tough, because Gerrard Everard, as Lewis, is ridiculous – an astonishing virtuoso, channeling both Lewis’ musical talent and his, shall we say, extreme eccentricity. Matt Cage brings just the right combination of swagger and insecurity to the role of Elvis – and some fine musical ability to Elvis’ music. We were somewhat disappointed in the work of Maxwell Theodore LeBeuf as Johnny Cash – but others who attended different nights loved his work, so I wonder if there was a problem with his voice on our evening. He’s done the work before, to good reviews, so I’m willing to give him the benefit of the doubt. Three other actors share the stage. J. Sean Elliott as Sam Phillips, entrepreneur, father figure, and narrator of the story. I’ve seen this play twice, the previous time at Branson, and Elliott could own this part anywhere. Laura Mae Nason plays Dyanne, Elvis’ girlfriend, and she steams up the studio with voice and sensual presence. I’m told (back stage at Branson, actually) that Elvis really did have a girl with him that night, a woman who went on to be a teacher, and wanted no part of this “Million Dollar” resurrection. The rhythm section of Zachary Knowles ( no relation) on bass and Scott Carmichael on drums might not be noticed, tucked into the back, except they, too, are so darned good. They have the job of setting the scene during narrations, by playing some tight riffs behind the spoken word.